Tranquility is a perfect hideaway for those who want a private villa with exceptional views, private pool, great service and a casual feel. The villa feature two air-conditioned bedrooms with ceiling fans and French doors that lead to a cobblestone patio that faces the Blue Mountains! ... perfect for morning coffee or cocktails at sunset! 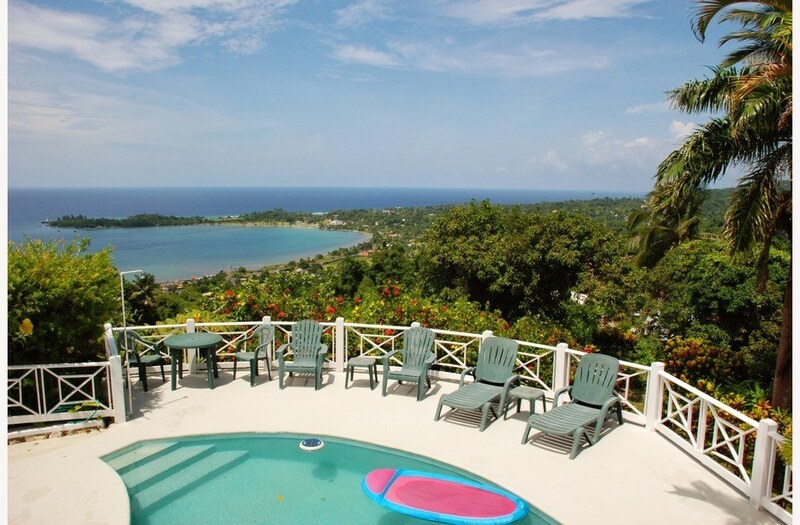 Lounge pool side, gaze out at the ocean from your living room or front porch ... watch the colors change over the Blue Mountains from your bedroom balcony ~ Nestled 1/4 mile up Richmond Hill overlooking Port Antonio & its magnificent harbor "Tranquility" is truly yours. Imagine waking up to the sun streaming in the patio door. 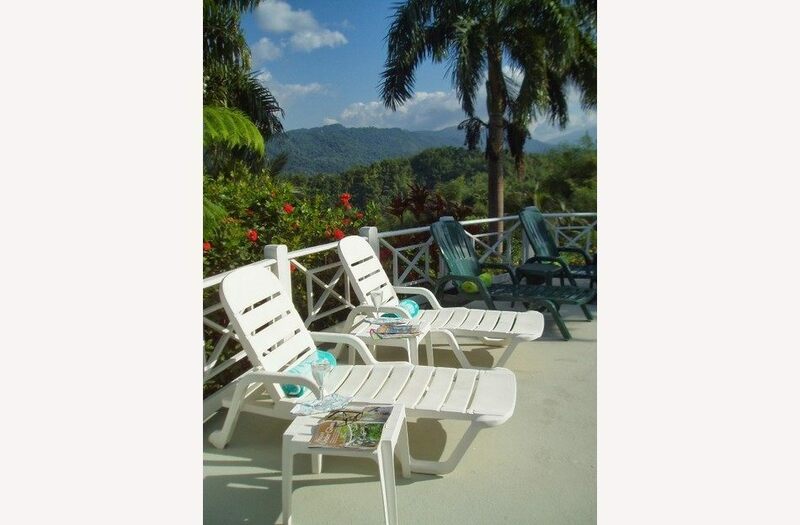 Sit up and look out over a panoramic tropical vista of the Blue Mountains and warm Caribbean Sea. You get out of bed, and sit out on the deck, watching the hummingbirds feeding on the masses of beautiful flowers, and listening to Nature. Your cook brings you a sumptuous breakfast for two, as your partner joins you on the pool...As you start to eat, you discuss what you want to do today. 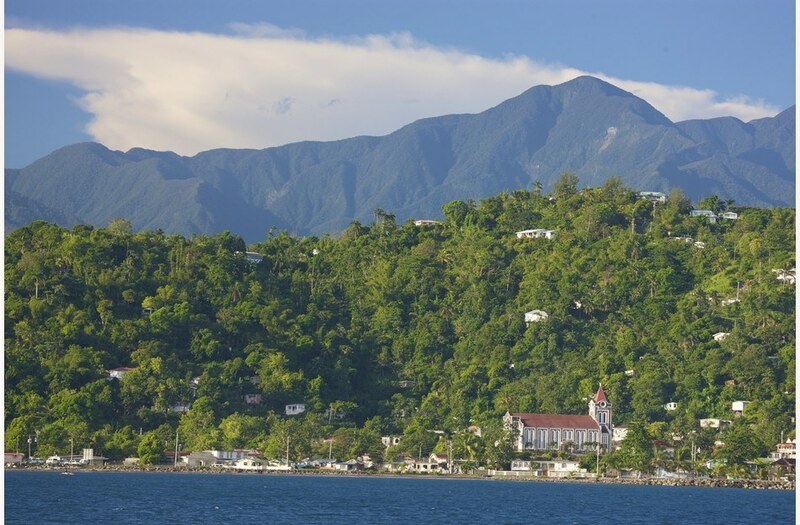 And there is plenty to do in and around Port Antonio, Jamaica. The villa offers Satellite TV on Flat screen in living room. Wireless DSL Internet. Free telephone calls to the US & Canada, VCR, DVD,CD + games and books. You couldn't find a better place to relax, and enjoy the fantastic vacation experience that Jamaica and only Port Antonio can offer. 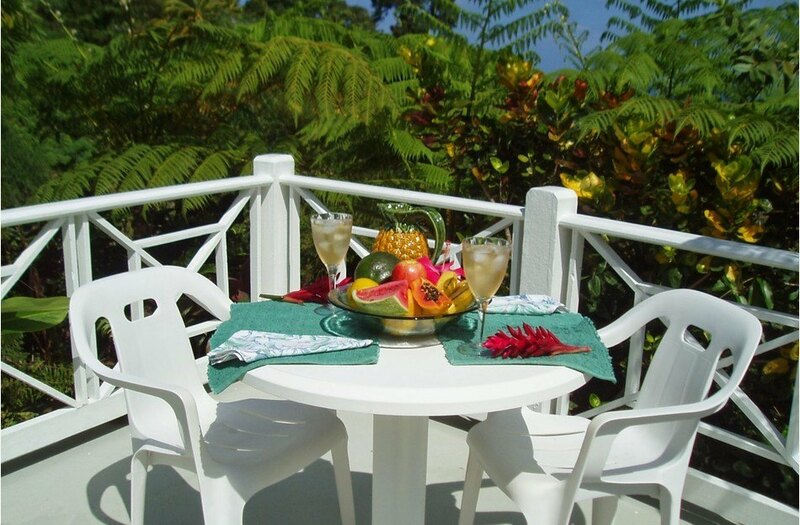 Your rental includes the fully staffed villa and all amenities. 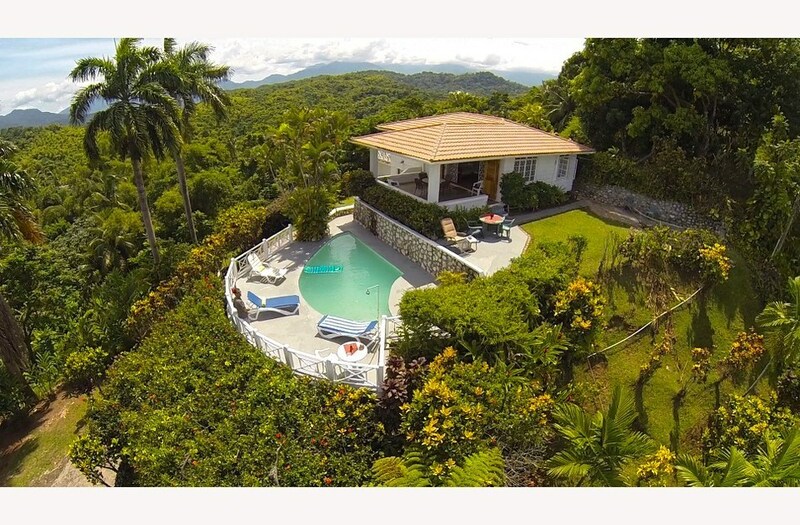 Not included is the cost of groceries & the staff gratuity (15% of the rental paid in Jamaica). Please use the form on the right for inquiries & reservations. This review is late, but non the less I had to comment to persuade any future visitors...This home is amazingly beautiful and clean!!! It is open and fresh and the decor is perfect. The view are like non that Ive seen!!! Blue mountains in the back and the ocean in the front! The staff was delightful. Beverly's cooking was impressive and better than any restaurant i'd eaten at in jamaica!!! It was a honor having her cook for us and it also saved us money! Fresh lobsters, you name it..you tell her what you want and she'll make it happen. The grounds keeper was nice and made us (3 girlfriends) feel very safe! Now the downfall to the property is you need a driver. it is very high up on the hill, i personally wouldn't attempt walking!!! We hired a driver Charlie who was knowledgeable about the area and history for a extra fee....I loved port antonio and my experience at tranquility! I'll definitely be back!!! oh and don't let me forger Fred, the owner of the home who was so very helpful with my 100 calls to him before booking!!! This home is a real treasure! Enjoy! I've traveled to jamaica several times but never to port antonio. Being unfamiliar with the area I chose this beautiful property. The home is very high up the hill, but once you've reached the top the views are literally priceless! 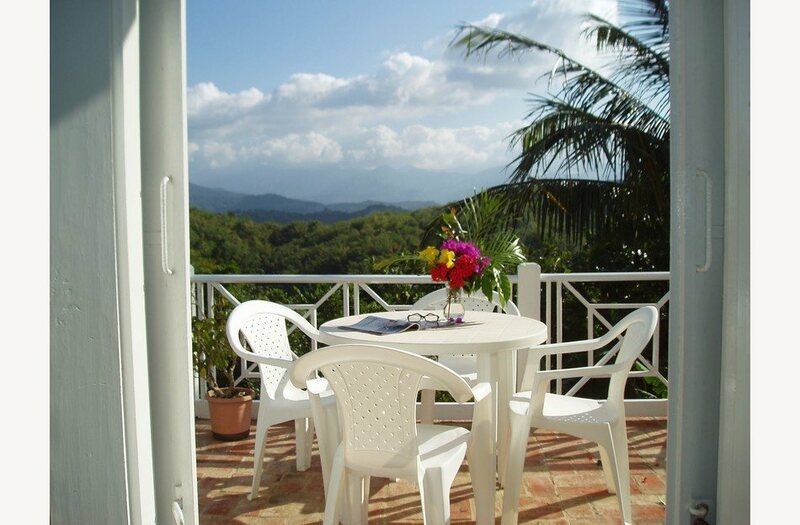 To the back you have the lush view of the blue mountains and to the front of the home you have views of the harbor. This home is truly gorgeous with great energy. It is very well kept and maintained and we felt completely safe and comfortable! The staff is amazing. You'd be silly not to use the house cook Beverly. She prepares amazingly flavorful meals that won't dissapoint and its more cost effective then resturant dinning. Dennis was very helpful and Charlie the driver is also great! I would recommend this property to the pickiest of travlers. And would definitely return myself!!! This has to be the most amazing place I've ever been to. Beverly & Dennis made us feel so welcome ,it was like meeting family. The service provided by Dennis would grace any 5* establishment, all your needs are catered for & absolutely nothing is a problem, you want it you got it . 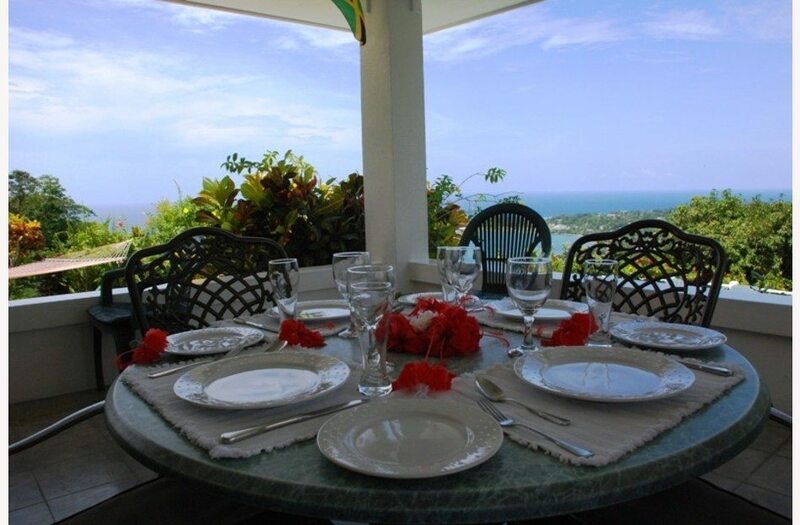 The true flavours of Jamaica were delivered in abundance by Beverly "the best cook ever" with her breakfasts & traditional dinners, served overlooking the mesmerising views of The Blue Mountains & The Port of Antonio just willing you to explore this jewel in the Caribbean. Planning my next visit already & I haven't even left yet. If you're looking for paradise, look for Tranquility. 1 love.. This was my second time staying at Tranquility, (15th trip to Jamaica), My stays at Tranquility, were by far the best! Each stay gets better and better! I love the home, it's beautiful, spacious, clean, private, and the view is priceless! It's far enough away from everything, that you have the privacy you desire, but it's close enough to experience everything Jamaica has to offer. The food the cook made was fabulous, it was wonderful to have exactly what we wanted for our meals. (Helpful if your'e vegetarian, or have special dietary needs- one of us is vegetarian and the other, not). Can't pinpoint what I like most. Meals outside with a beautiful view and flower decorations on the table, lots of sun on both sides of the house, the food, swimming pool...? I loved, loved, loved everything! All of my vacation needs were met, and then some! Can't wait to get back! Tranquility Villa is without doubt the most idyllic place we have ever stayed. 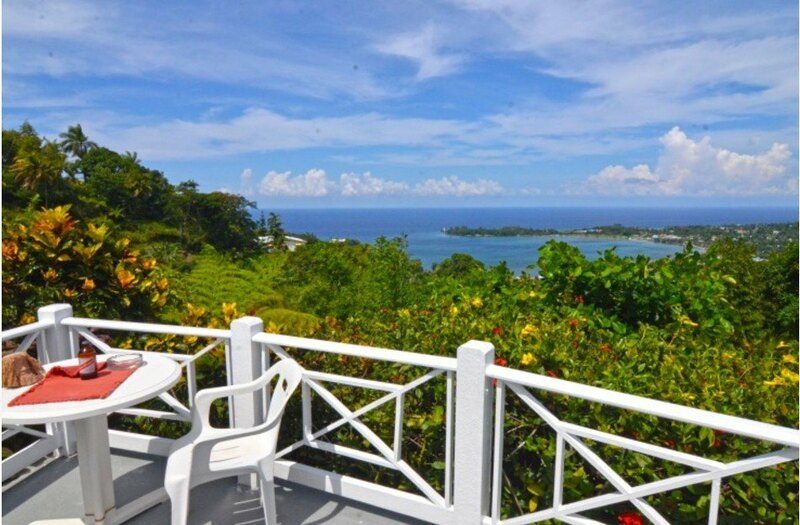 Set in a truly beautiful location above Port Antonio, the spectacular views of colourful tropical jungle against a back drop of the Blue Mountains to the south and the turquoise Caribbean Sea to the north were unrivalled and provided the perfect place to while away lazy, relaxing hours. Indeed we didn't feel the need to go anywhere, especially as we were looked after so brilliantly by Dennis and Beverley, who couldn't have been more kind and friendly. Fantastic home cooked Jamaican food and lovely attention to detail, such as romantic floral touches and delicious fresh soursop juice, they were brilliant hosts. Thank you, thank you! All in all, we LOVED everything about Tranquility villa and would definitely head there again should we have the chance to return to Jamaica. We had a truly lovely time at your villa. It really is in a fantastic location and we really fell in love with everything the parish had to offer (especially Frenchman’s Cove and Winnifred Beach) All the meals Beverly cooked were absolutely delicious and Dennis ensured that we would want for nothing and both put us very much at ease. "Views that can't be beat"
Our recent stay at Tranquility Villa was very relaxing. Beverly was a great cook and introduced us to delicious Jamaican cooking. Oxtail will now be on our menu!Charlie was a great spokesperson for this beautiful part of Jamaica and took very good care of us as he showed us all the sights. The villa was very comfortable and well maintained but the best feature was the views from all the decks...unbelievable! Tranquility villa is gorgeous! 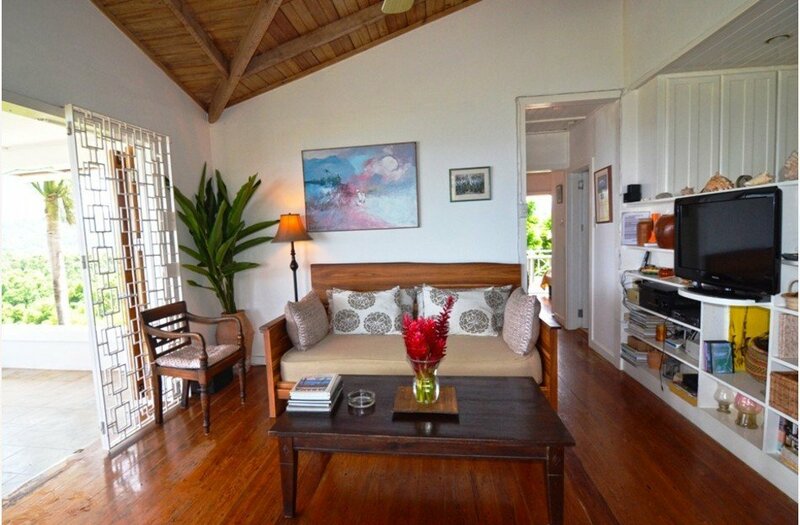 The home is spotless, and tastefully decorated in Caribbean style. 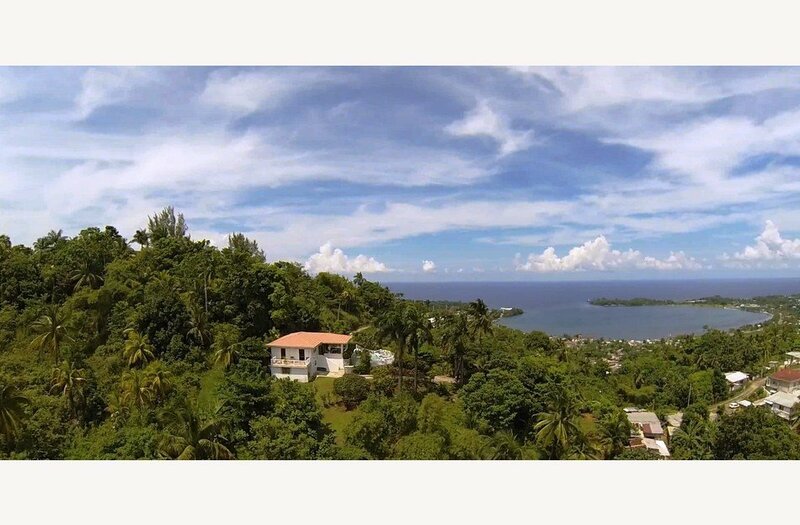 This villa sits high above Port antonio with a billion dollar view! It delivers tranquility, pampering, and is centrally located for many activities. We especially enjoyed the soft music sounds of Port antonio drifting up to the villa.The villa had a great sound system of it's own that could be heard inside and outside, that we enjoyed daily. Beverly cooks anything you request. She is very helpful setting up menus,and will accompany you to the stores or will do the shopping ahead of time, or when needed upon arrival. The highlight of the day was awaiting her scrumptious meals! She was also a friend in need when I sustained a minor injury during the visit, which required going to a local hospital. (my fault..no defect in the villa! )Thanks again Beverly!! Dennis was very professional and friendly. He gave us great advise on places to visit, etc. He did all he could to pamper us during our entire stay. He fixed us daily fruit smoothie pitchers to mix with our rum for happy hour or to have at breakfast time! He took great care of us during a tropical storm we experienced while we were there, and from our viewpoint this storm was fun to watch and did not detract from our visit. The villa was safe during the storm as well as at night! I loved the view and the pool more than anything...however, you had to earn the view by ascending the road to the villa. I rented a car and drove myself for the most part. I would do it again, however, it does come with some trepidation! My nephews stated you had to earn that tranquility by arriving at the villa, but it made it all the more special! Believe me, if I could do it...so could anyone else. I have a fear of heights! Having said that I would do it again and again, and would rent a car..so it couldn't have been that bad! Hard to say goodbye to Dennis and Beverly, as well as this perfect spot in paradise! Stayed at Tranquility Villa with my sister recently, and it surpassed all of our expectations. The views are stunning and the house is very comfortable. Our trip was the perfect balance of adventurous excursions and relaxing at "home," either by the pool, on the veranda or the back deck overlooking the Blue Mountains. 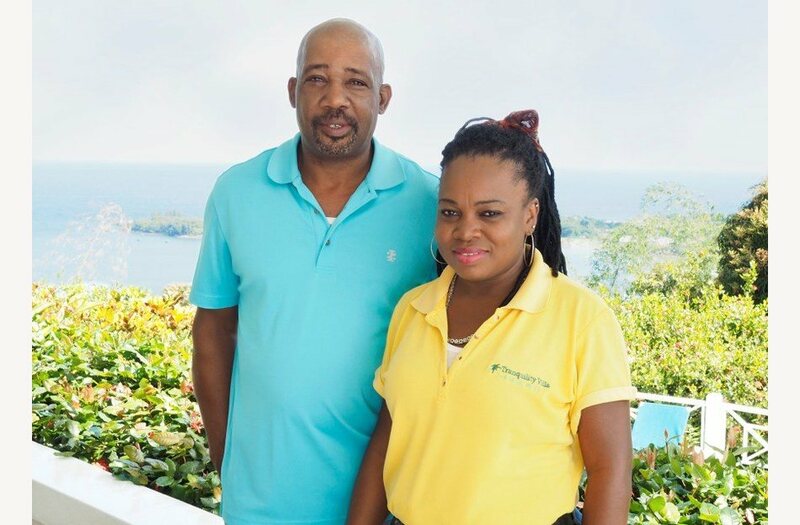 The staff, Dennis and Beverly, are very friendly and made our stay so enjoyable - it was great to get to know them and learn about Jamaica from them. Everyone bent over backwards to ensure we had a great vacation - starting with Charlie, the chartered driver who picked us up at the airport and served as our tour guide during our stay. I'm already looking forward to my next trip there! Fabulous view! Great wraparound decks!!! 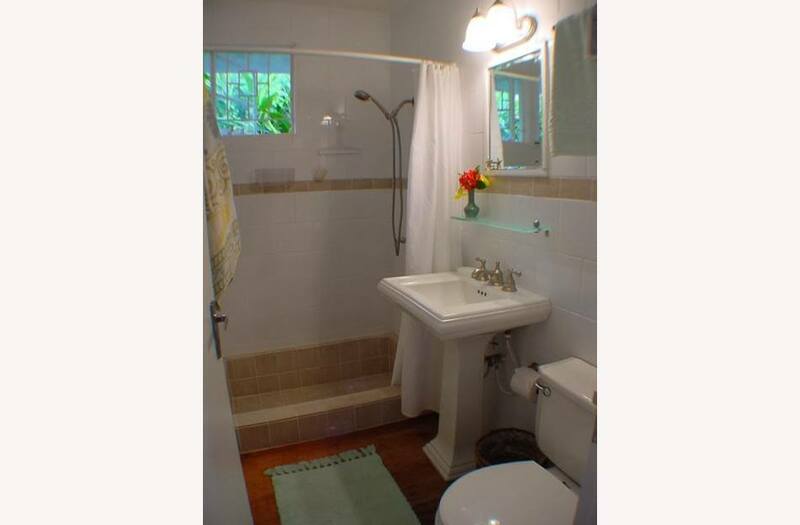 This house is wonderfully decorated, situated and staffed. We were welcomed and made comfortable by Dennis and Beverly who took very good care of us. Beverly cooked wonderful meals for us upon request or stayed away if we felt like cooking ourselves. The location of the house is fabulous. We spent many hours just sitting on the decks with our feet up watching the sunsets, sketching the palms and looking down over the harbor lights of Port Antonio at night. Wonderful vacation! And the house was extremely comfortable. Being British I'm not given to superlatives but this place was absolutely incredible. As others have remarked it exceeded all expectations and you really had to pinch yourself to check you weren't hallucinating . The views over to the bay in front and to the Blue Mountains behind will make your spirit sore. The villa is ideally designed to take full advantage of the beautiful vistas with patios to the front (3) and rear. The pool is great: small but we managed to use it for exrcise as well as lazing on the floating pool loungers just taking in the views. The villa is very well designed and furnished and exudes quality. Denis and Bev were great, the latter cooking up a string of tasty meals. The drive up is not for the fainthearted being rather steep with the odd cavernous pothole but you soon get used to it. The villa is very private and secluded but is not isolated as there a number of others houses around. We travelled across Jamaica and Portland was easily the most beautiful part. You will be tempted to spend all your tie relaxing at the villa but the nearby beaches are stunning e.g Frenchman's Cove. Port Antonio is a lively place with a great daily market. Forget all the hotels - none of them have views to compare with this place. visited this property with my wife and twin 3-year old girls. Girls loved the small pool - it was perfect for them. The views are just amazing. 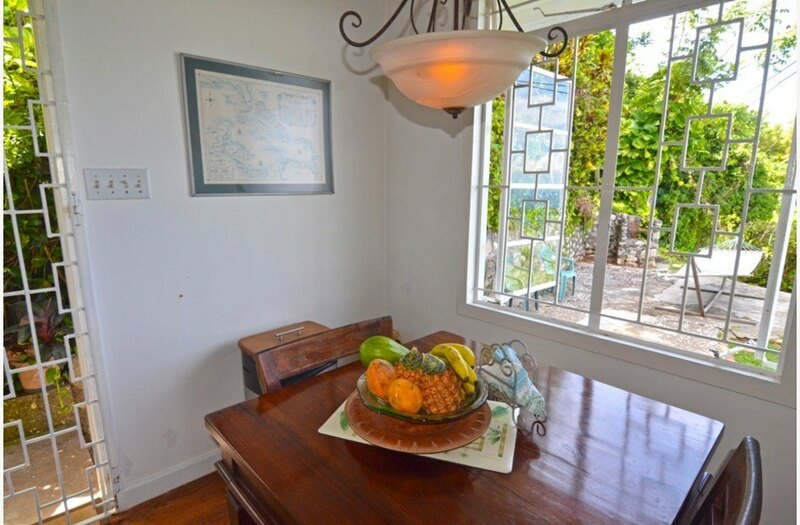 Property is just a few minutes drive from all the sites including Frenchmen's cove. Dennis and Bev are just amazing...so helpful with everything. Would recommend the property w/out any hesitation. I travelled to many places but have never felt upon entering my lodging the way I did when I set my foot in Tranquility Villa. The place is indescribably beautiful -- the pictures on the website do not justice to the views you have from the villa. Together with my family, we had huge trouble coming up with appropriate adjectives that would sum this place up. 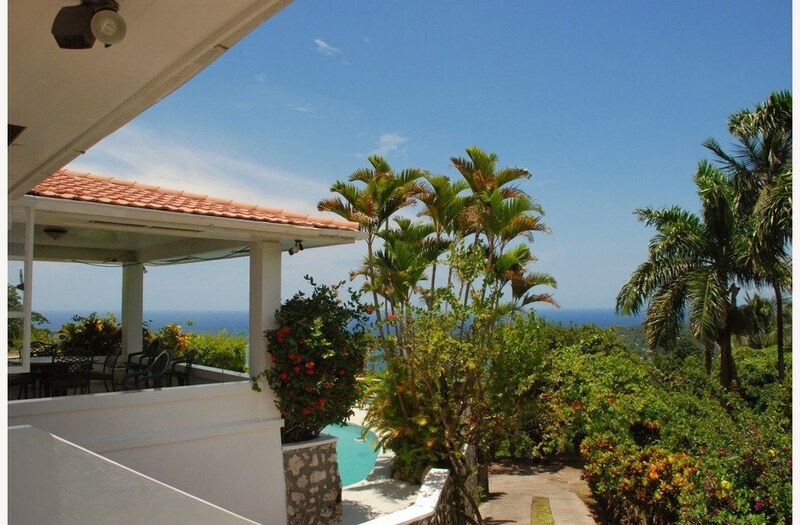 You have the view of the Caribbean Sea to your left, palm and bamboo trees and Blue Mountains in front of you and to your right. The villa staff -- Dennis and Beverly -- should teach courses on hospitality. They were warm, friendly, and welcoming; we immediately bonded with them. Dennis cut gorgeous flowers every morning to set at the table on the terrace. Beverly cooked Jamaican food that was just incredible. Our driver, Charlie, proved to be so much more than a driver. He was an amazing guide. He went out of his way to accomodate us and to show real Jamaica to us. I really have nothing negative to say about Tranquility Villa. 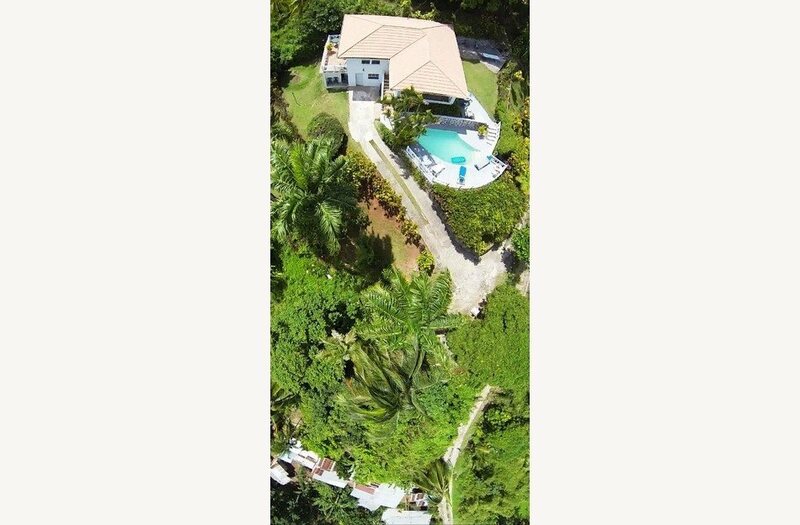 The villa is clean and stylishly furnished, the beds are comfy, the service is impeccable, and the owner with whom we booked our stay was kind and willing to spend considerable amount of time over the phone with me prior to our landing in Jamaica and answer my questions. The ride through Blue Mountains to get to Port antonio is beautiful and definitely worth the 2 hours in the car. Since getting back, we are recommending Tranquility Villa to all our friends and family. Just before leaving the villa, we took a picture with Beverly, Dennis, and Charlie and as we were leaving, found ourselves tearing up -- which tells you how lovely the staff was towards us! It was a heavenly stay! We adored our stay at Tranquility -- it truly lives up to its name! This elegant, old-school school villa, built in the 1950s, is perched on a mountaintop. The views alone (Port antonio bay one one side, Blue Mountains on the other) are worth the price of admission! The house is small (5 people max but 4 is ideal) but airy and completely private. 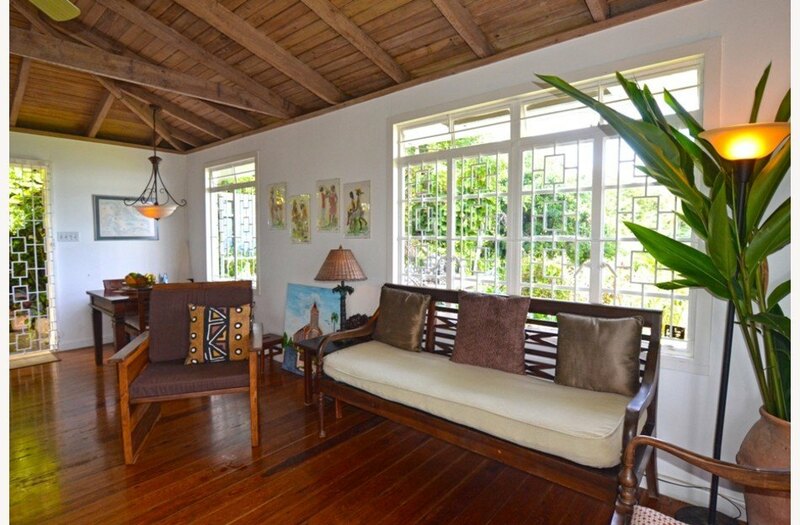 And the decor -- white wood wainscoting, ceiling fans, teak floors and simple white beds with mosquito netting -- is classic Jamaica (Noel Coward or Ian Fleming would have been very much at home here). Our stay was made even more delightful by a warm and professional staff: Beverly, a gifted cook specializing in Jamaican cuisine, on-property houseman Dennis, and on-call driver Charlie. Frenchman's Cove, a gorgeous private beach, is a 15-20 minute car ride away -- but truthfully, this is the kind of place where you can wile away the hours sitting by the pool and watching the changing views as the light shifts. One issue to take into consideration: the trip from the airport is 2- 21/2 hours through winding mountain roads. But the setting and staff make it well worth the wait!